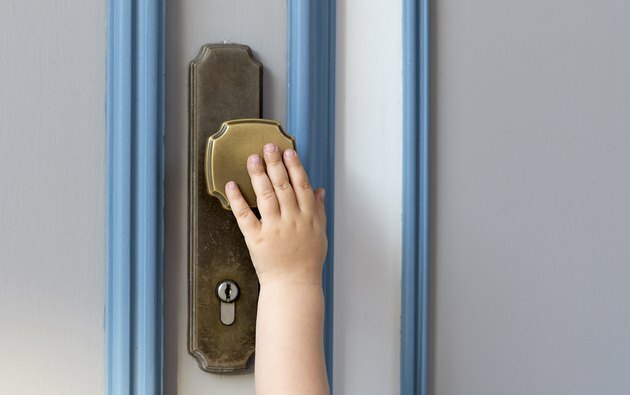 The majority of doors already have a doorknob hole when purchased. But if you buy a slab or blank door, it requires a hole. Slab or blank doors are more affordable than ready-to-hang doors, and you get to choose the finish and hardware. Measuring, drilling and installing a doorknob is something a DIY homeowner can do. Don't be intimidated by this simple task. Doorknob height can be raised to prevent children from using them. The International Building Code has established doorknob height between 34 and 48 inches above a finished floor. Installers typically drill the hole centered 36 inches above the floor -- if not specifically instructed to do so differently. Exceptions to the rule include doors that provide egress into swimming pools or other water features. In this instance, the doorknob is installed 48 to 54 inches above the floor, specifically to raise the knob out of the reach of small children. Before drilling a hole in a blank or slab door, measure the knob heights of your existing doors. Floor designs may have changed, or existing floors may have been overlayed with new flooring, and your doors may have been trimmed to fit. If your existing doorknobs are more than 1/2 inch off the standard 36 inches, drill the hole to match your existing knobs; the failure to match the doorknob height with existing doorknobs in the home is visually unsettling. Standard interior slab doors are 80 inches tall. If you're installing several doors, it's acceptable to drill the doorknob hole at 40 inches, or centered vertically. Installation at 40 inches is common on affordable homes, mobile homes and production homes. Centering the doorknob vertically allows the door to become universal -- in other words, there's no definitive top or bottom. The door can be made to swing to the left or right if needed -- if the hinge mortises have not been previously cut. Check the sides of the door for a bevel before drilling. Place a try square along the side of the door. If the door has a 2- to 3-degree bevel on one side, the doorknob must be placed on that side. The bevel allows for the edge of the door to clear the jamb when the door is operated. It's a shallow bevel, and you might not be able to see it, so use the try square to be sure. In some instances, if the door rubs on the jamb after it's installed, you may need to sand or cut a shallow bevel on the doorknob side of the door. Measure up vertically from the bottom corner of the door, and make a mark on the edge of the door at the desired height. Use the try square to make a light, 3-inch-long horizontal line, perpendicular to the grain, inward from the mark. The backset is the corresponding vertical mark needed to center the knob. For interior doors, make another mark at 2 3/8 inches from the edge, to intersect the horizontal mark. Mark the line at 2 3/4 inches for an exterior door. The point where the two lines intersect is the center of the hole. The hole saw has a pilot bit that centers on the mark. You'll be using a 2 1/8-inch hole saw to drill the hole for the typical interior or exterior doorknob. Never drill into a door without proper backing. Hole saws are aggressive. When the bit passes through the veneer on the opposite side, it will tear or splinter the veneer unless you use backing. Clamp a scrap piece of wood on the opposite side of the door where the bit will emerge. Splintering, chipping and blowout is prevented by backing. Never skip this important point. Edge bore, or cross bore, is the horizontal hole needed for the striker. The striker is the shaft that moves in and out of the door to penetrate into the jamb -- the diameter is 1-inch. After drilling the 2 1/8-inch bore hole, center the 1-inch cross bore hole to penetrate through the edge of the door, perpendicular into the larger hole. The placement of the cross bore hole is important for the doorknob to operate properly. Use a jig or template to get it straight. Freehand drilling of the edge bore is possible if you're an expert or if you're confident that you can drill it straight. What Is a Dummy-Set Doorknob?